The blocks in Snippets are the same size as those of Raconteur but in a different range of fabrics and values. In the original Raconteur all of the backgrounds were light and the outer borders were the same, whereas the main design sections were pastels, or what I saw as pastels. 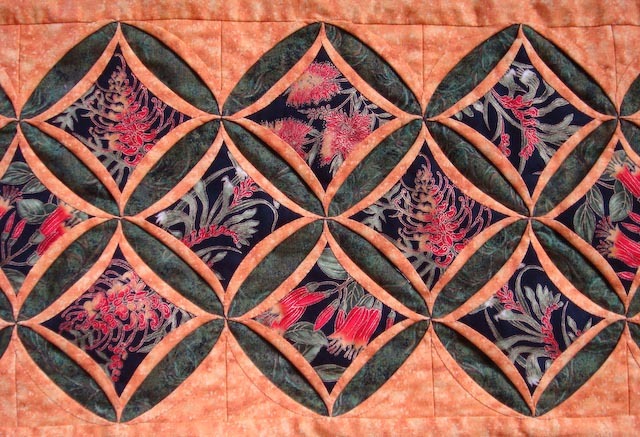 For Snippets I have decided to border the block in the same fabric as the main design. As is obvious from just this block the change is quite dramatic. I have had to add sashing between each of the blocks in Snippets since unlike Raconteur without the sashing the different blocks clash. I am still working on finishing the outer edge of the block and will upload the entire block when I have done so. Hopefully in the next week or two. Well I have finally finished. I have for many years wanted to make something using cathedral windows but figured my attention span wasn't in for the long haul. Actually about five years ago I even enrolled in a class with Megan Orr to learn how to do it properly. Unfortunately only one person enrolled in the class... little me... and so it was cancelled. I had been so keen to do the class that I had purchased the fabrics and was set to go. Well the fabric became a PIG (Project in Grocery Bag) until last year I met Megan at the Sydney Quilt Show. As we started talking I told her about my fabric and plans to 'one day' make something small. Megan was wonderful and explained how to do it. She even had samples there to show me the different stages. So armed with fabric AND knowledge I started my runner. I made this one shorter than usual as the table upon which it lies is only small but I like it. I have also been working on a normal length one using Australian flower in the windows and boy has that taken a long time. With the help of a few friends I have now finished the top and now only need to quilt and bind it. Hopefully should be finished soon. Tonight I drew up the foundation papers for my feathered star...isn't it cute! And yes before you ask the block is the same size as the applique ones I uploaded a couple of nights ago... 2.25in after the border has been added. As you can see there is even some space around the star to allow it to float in the background before it reaches the border. This was added when I was planning just in case my block turned out too big. There is no way I wanted the points cut off and neither did I want to have to remake the block. Definitely perfect for those small scraps you have been saving for just one day. 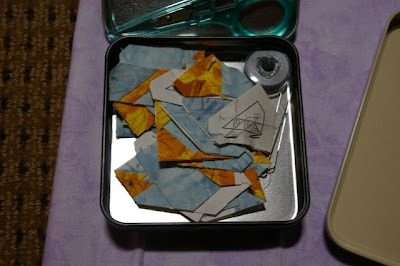 Mind you it is necessary to have a lot of those scraps. From memory there were only 142 pieces in this block. I was in a real feathered star phase when I designed this one. 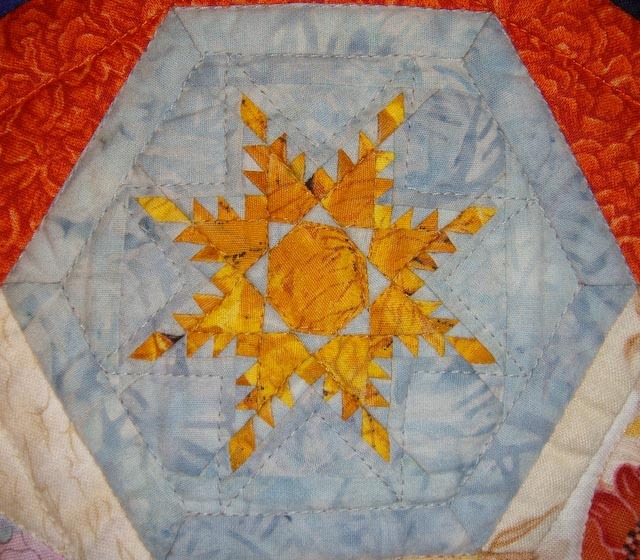 I had recently returned from the guild's Quiltaway weekend at Jamberoo where Jane Gibson was making tiny feathered stars and I knew I just had to try it. I had never made anything so small and so I went looking into what would be the best way to do it and that was foundation piecing. 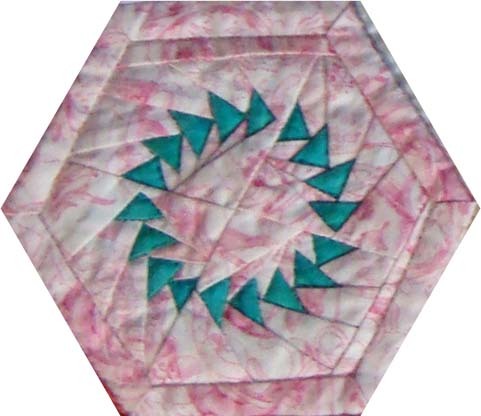 When I made this I figured I would simply make it the usual way, a square but have extra fabric around the edges so that I could cut the hexagon from it. In the second photo you can see the block when I was part way through making it. Yes that is a bobbin in the corner and that little piece of paper beside it has seven pieces sewn to it... see I told you it only needed small scraps. 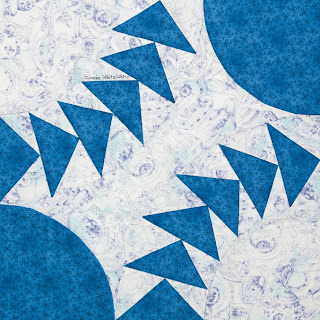 A couple of years ago a friend, Isobel Lancashire, asked if it was possible to modify one of my patterns which had appeared in Down Under Quilts. 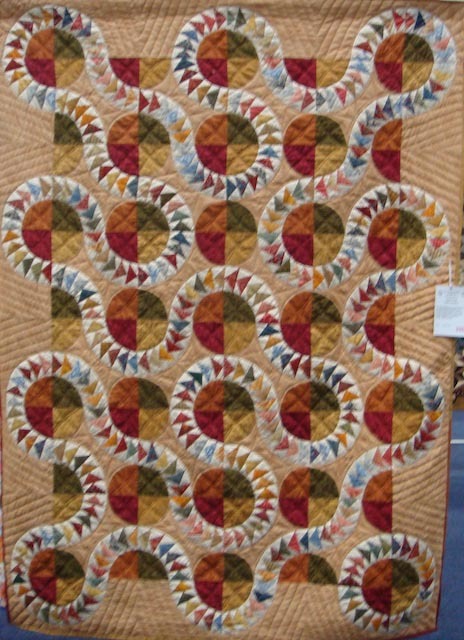 She wanted to make a large single bed quilt from what was originally a king size. The original design was based on New York Beauty. 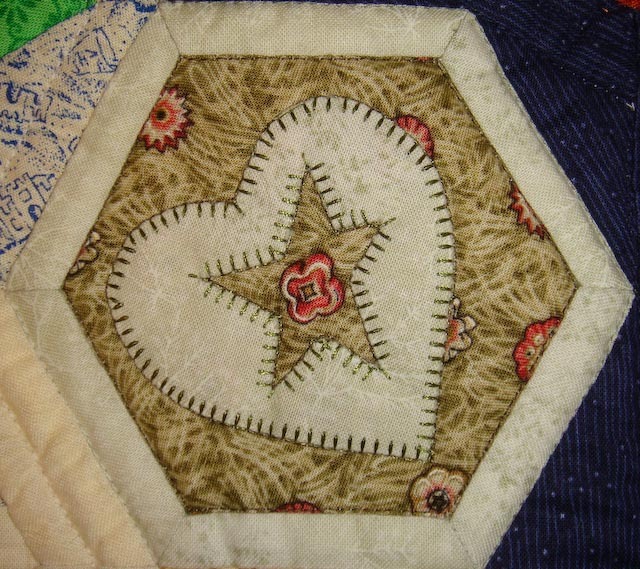 At the same time I had this idea floating in my head and persuaded her to make it instead, even though she could only see what one block looked like rather than an entire quilt. Above left you have what it looked like part way through. I am positive that Isobel was wondering what she had let herself in for at the time:) but she persevered. From this came Jarrah's Track,on the right, which was hung at the Sydney Quilt Show in 2011. Looks great doesn't it. And her grandson, Jarrah loves it too... he was heard asking if it was to ever return after Isobel had loaned it to me for photographing for Australian Patchwork and Quilting wanted to publish the pattern. 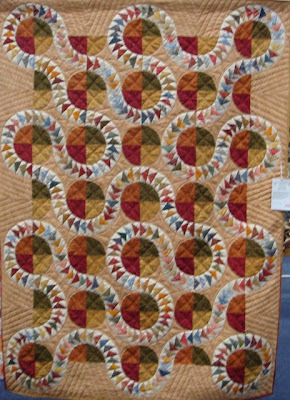 A short time later Quiltmaker called for entries for its new magazine 100 Blocks and so I thought why not. Made a quick sample, and accidentally made an error with the arrows but the block was still successful and appeared in Volume 4 under the title of Isobel's Flight... her own block. While making Raconteur I wanted to include blocks from previous quilts that I had designed and so this was the inspiration for Isobel's Flight Too. 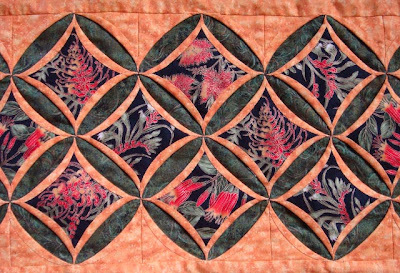 Interesting the original block was 8in in Jarrah's Track, the next was 12in in Quiltmaker and my latest was less that an 1 1/2 from one side to the other of the arrows.. a bit of a change. 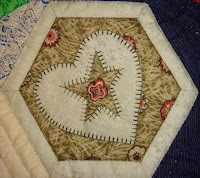 I have been writing up my patterns for Raconteur and have been working on the applique patterns lately so I thought that I would share some of the blocks with you. 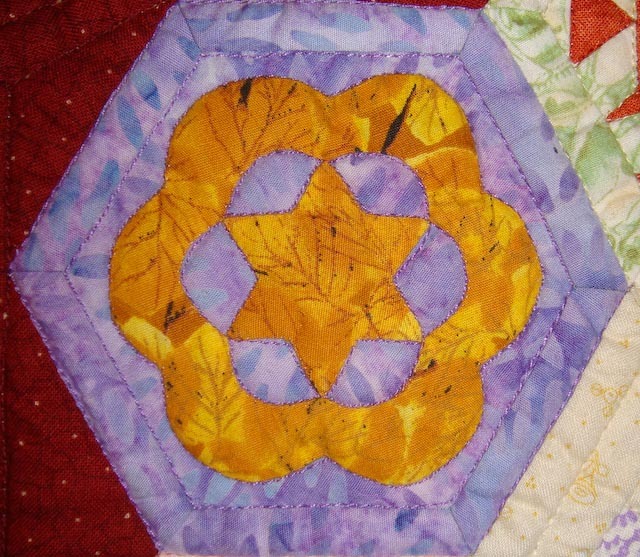 There wasn't much choice in what to feature here as I have only five applique blocks in the entire quilt. Not bad considering there are 363 blocks altogether. 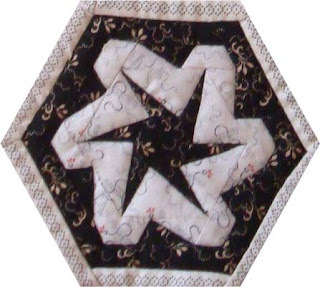 I initially intended that there would be no applique apart form one by Merelyn.... a common held belief is that if a quilt doesn't have applique then it can't succeed at various quilt shows. Applique has never been a technique which I enjoyed and so I seldom use it. Merelyn was happy to make a block for me. Can you guess which one she did? 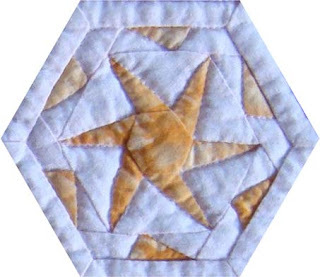 Ok so it really is a no brainer... the star within the heart is my usual applique... fused and machined. The travelling moons are my second kind of applique... a bit puffy and almost smooth. Merelyn never does applique like this due to the fact that she always has points which are pointy, curves which are smooth and so little seam allowance that when you handle the fabric it feels as though there is only one layer of fabric... and she hadn't cut away the backing fabric... plus you can't see her stitches. No wonder she wins all of the competitions and everyone wants to learn from her. Mind you I still think my idea was the best... get her to actually make the block. I am positive my eyesight would go before I would have the hand skills to even pretend to be pretender! 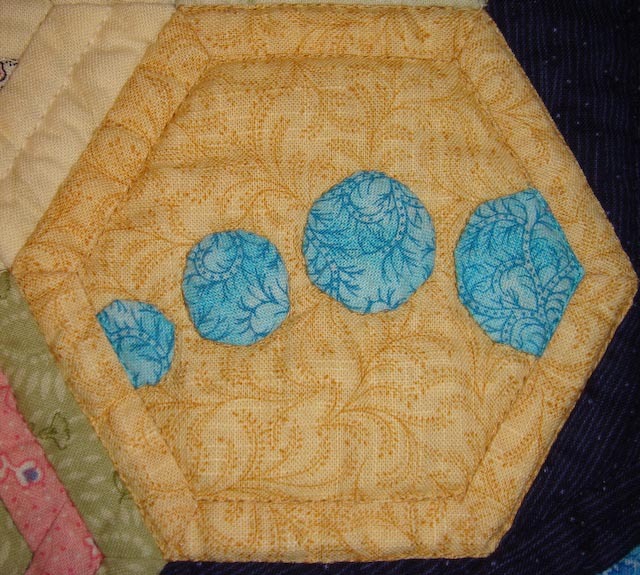 Oh by the way the size of the blocks in Raconteur are only 2.25in AFTER the border has been added. 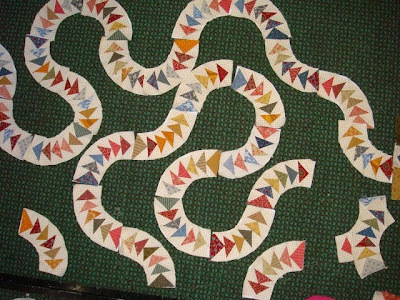 This may not seem too small, particularly with applique blocks but wait until I upload some of the pieced blocks.